Few people run Python programs by double-clicking the .py file as if it were a .exe file. When a typical user (non-programmer types) double-clicks an .exe file, they expect it to pop open with a window they can interact with. While GUIs, using tkinter, are possible using standard Python installations, it's unlikely many programs do this. What if it were so easy to open a Python program into a GUI that complete beginners could do it? Would anyone care? Would anyone use it? It's difficult to answer because to date it's not been easy to build a custom GUI. There is no shortage of GUI frameworks for Python. Tkinter, WxPython, Qt, and Kivy are a few of the major packages. In addition, there are a good number of dumbed-down GUI packages that "wrap" one of the major packages, including EasyGUI, PyGUI, and Pyforms. The problem is that beginners (those with less than six weeks of experience) can't learn even the simplest of the major packages. That leaves the wrapper packages as a potential option, but it will still be difficult or impossible for most new users to build a custom GUI layout. Even if it's possible, the wrappers still require pages of code. PySimpleGUI attempts to address these GUI challenges by providing a super-simple, easy-to-understand interface to GUIs that can be easily customized. 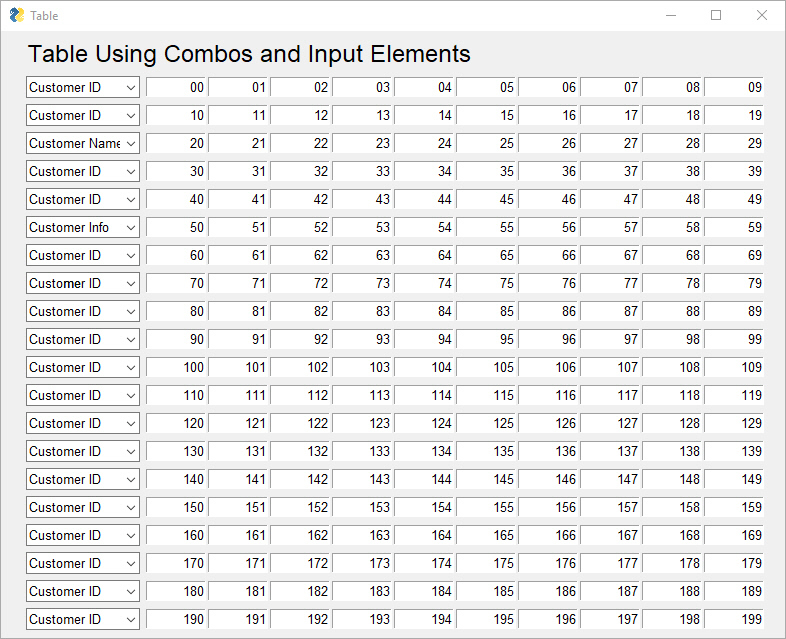 Even many complex GUIs require less than 20 lines of code when PySimpleGUI is used. What makes PySimpleGUI superior for newcomers is that the package contains the majority of the code that the user is normally expected to write. Button callbacks are handled by PySimpleGUI, not the user's code. Beginners struggle to grasp the concept of a function, and expecting them to understand a call-back function in the first few weeks is a stretch. With most GUIs, arranging GUI widgets often requires several lines of code… at least one or two lines per widget. PySimpleGUI uses an "auto-packer" that automatically creates the layout. No pack or grid system is needed to lay out a GUI window. Finally, PySimpleGUI leverages the Python language constructs in clever ways that shorten the amount of code and return the GUI data in a straightforward manner. When a widget is created in a form layout, it is configured in place, not several lines of code away. What's expected from most GUIs is the button that was clicked (e.g., OK, cancel, save, yes, no, etc.) and the values input by the user. The essence of a GUI can be boiled down to a single line of code. This is exactly how PySimpleGUI works (for simple GUIs). When the call is made to display the GUI, nothing executes until a button is clicked that closes the form. There are more complex GUIs, such as those that don't close after a button is clicked. Examples include a remote control interface for a robot and a chat window. These complex forms can also be created with PySimpleGUI. Let's look at the first recipe from the book. It's a reasonably sized form. If you just need to collect a few values and they're all basically strings, you could copy this recipe and modify it to suit your needs. You can even create a custom GUI layout in just five lines of code. If you have a straightforward layout, you should be able create a custom layout in PySimpleGUI in less than five minutes by modifying code from the Cookbook. Widgets are called elements in PySimpleGUI. These elements are spelled exactly as you would type them into your Python code. There are also shortcuts for more generic button functions. 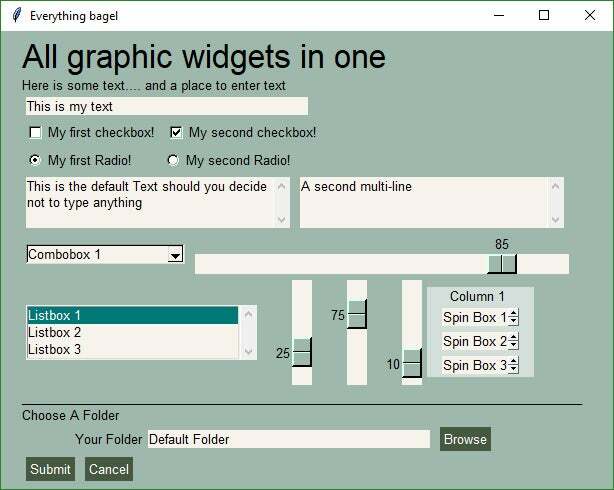 These are all the GUI widgets you can choose from in PySimpleGUI. If one isn't on these lists, it doesn't go in your form layout. The stuff that tends not to change in GUIs are the calls that set up and show a window. The layout of the elements is what changes from one program to another. These are line-for-line what you see in PySimpleGUI's design pattern. To create your custom GUI, first break your form down into rows, because forms are defined one row at a time. Then place one element after another, working from left to right. Once you have your layout complete and you've copied the lines of code that set up and show the form, it's time to display the form and get values from the user. Forms return two values: the text of the button that is clicked and a list of values the user enters into the form. Checkbox elements return a value of True or False. Because the checkboxes defaulted to unchecked, both the values returned were False. Once you have the values from the GUI, it's nice to check what values are in the variables. Rather than printing them out using a print statement, let's stick with the GUI idea and output the data to a window. PySimpleGUI has a number of message boxes to choose from. The data passed to the message box is displayed in a window. The function takes any number of arguments. You can simply indicate all the variables you want to see in the call. Now that you know the basics, let's put together a form that contains as many of PySimpleGUI's elements as possible. Also, to give it a nice appearance, we'll change the "look and feel" to a green and tan color scheme. This may seem like a lot of code, but try coding this same GUI layout directly in tkinter and you'll quickly realize how tiny it is. The easiest way to get a GUI up and running quickly is to copy and modify one of the recipes from the PySimpleGUI Cookbook. Have some fun! Spice up the scripts you're tired of running by hand. Spend 5 or 10 minutes playing with the demo scripts. You may find one already exists that does exactly what you need. If not, you will find it's simple to create your own. If you really get lost, you've only invested 10 minutes. Thank you for the writeup on this. I will forever be a beginner, as I have no interest in serious programming. Just like to doodle. Over the past couple of weeks, I've been thinking of trying to run some of the really easy "programming" / creative packages available under Windows. Even HTAs have crossed my mind. Been thinking about doing this under WINE or virtualized. Linux simply doesn't cater to easy... Even bash can be over-engineered. PySimpleGUI looks perfect (for some solutions). This may help entice me to working with python more seriously. This is an excellent introduction to a great solution to what has always been a vexing problem for me. I only had two minor issues with the code. 2. Again, for Python 3, you must use pip3 to install. Otherwise it ends up in the Python2 library collection. Now, what is the most efficient way to combine this with psycopg2 to insert and update records in a database? Consider also that the tables have been somewhat normalized, so each record may be spread over two or three different tables, and the value list for some fields must be taken from tables of static data. If the problem / application has a GUI or could benefit from a GUI, then PySimpleGUI isn't a bad place to start. If it's not a fit, you can quickly rule it out and move on. If the project looks like it may be a candidate, spend 2 minutes looking through the Cookbook for a rough match. Copy, paste, and run the Recipe code. Then it's a matter of modifying the code to match your application. The goal is to make it trivial to add a decent look GUI to software. It would be nice to introduce students to GUIs sooner than later in education by making it easy enough for beginners. My advice to you would be to jump in and try stuff. Make something run. Make anything run. Then modify it or even start over. Point is that you've got a working environment, a blank canvas. After taking a look, it won't work for me. While it's pretty easy to retrieve the id and display text from a static table, I need to only display the text in a list box, but return the id that matches the selection, since that is what will be stored in the new record. Maybe that would make a useful enhancement for a future release? If "tables" are a fundamental thing you need to interact with, then PySimpleGUI is not yet able to provide a way of doing this in an interactive way. There is no "table' widget I'm aware of in tkinter. I've looked at a few proposed solutions, but nothing has yet to rise to the top. The first step is to get the Column Element scrollable. It should be noted that PySimpleGUI's primary mission is to implement "Simple GUIs". I would urge you to write up an Issue and post it on the GitHub site if you have a feature idea or see a limitation. I'm confused about the operation you are attempting on a Listbox. The best way to communicate on these things will be via GitHub. I do a SQL select for the id and short name to get a list to chose from, then display that in a listbox. Once chosen by the user, I need to return the id to be stored in the new record. I can't accept the GitHub terms of service, so that is not even a remote possibility. Got it. 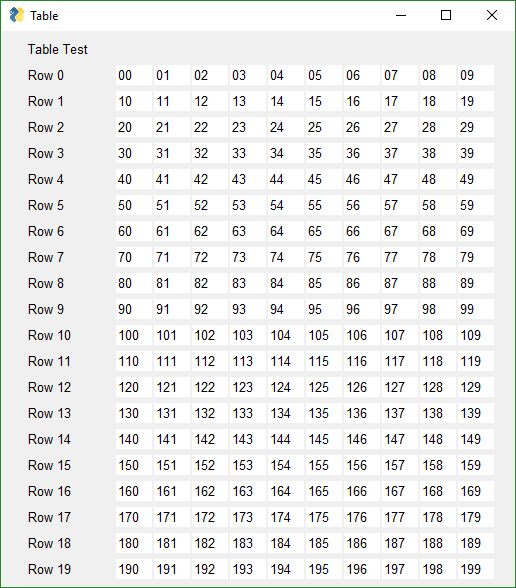 Just finished creating scrollable Column Elements, which paves the way for tables and the application like you described. What is the GitHub term of service that's blocking you? Perhaps it's been incorrectly stated. Which terms? I hardly know where to start. But let me give you the top three. 1 Section Q. Indemnification: If some imbecile decides to sue me over a perceived slight, or because he wants to steal my work, I would have to sell everything I own to pay the retainer fee for any lawyer who could respond to that complaint. There is no way I could indemnify anyone in a case like that. If you don't think that is likely to happen, read up on the history of JMRI. In addition, according to paragraph B3, they expect to hold teenagers to this requirement, and although I don't think the courts would allow that, it would still be very expensive for the kid's parents to find out. 2. Paragraph B4 says that when the web site is hacked, the users are still responsible for the breach, even though they have no control over the back end security. This is all too typical of the standard business contract where there is no actual negotiation involved. It becomes a one sided document with all of the risk dumped on the user. This presents me with a take it or leave it decision, and I choose to leave it. 3. Section R fails to define "material changes" in any meaningful way, there is only one weak example listed. That leaves far too much wriggle room for the lawyers, and it is entirely possible they could decide to sell all of the collected customer information, complete the changes to the web page in the middle of the night and have the money in the bank before the sun is up. Now that they are owned by Microsoft, I have to consider this a very real possibility. Inching closer to database editing applications. A new demo posted that shows how tables can be implemented. The last piece was being able to justify the text correctly in the input boxes. It looks very much like a typical data entry table. I'll open an issue on the GitHub. Please visit and enter more information so it can be debugged (Python version, Linux Version, etc). Issue solved mainly following suggestion by Robert McConnell (thanks !) . Are you saying you managed to get PySimpleGUI working with Python 2.7????! I so, PLEASE post the file to the GitHub (or anywhere else of your choosing). This request comes up from time to time. I received one earlier this week. Yes, it was a requirement for my project. Just tack the code above at the top of PySmpleGUI.py, insert the function call at every super() as: super(*(fSuprArgs(self))), move all *args to the last position in any parameter list where it appears, and you're done. I have already licensed the changes as CC-BY-SA, whatever that means, so feel free. Please Note: Tested with Python 2.7.12 only, and NOT TESTED with Python 3! Also, I have found there are many widgets that get confused, because they expect a color value tuple as the first param, so I always stuff (1, 1) and that prevents additional errors. Replying to myself: Looks like I misunderstood parameter type cardinality. The link below shows that 'formal' keyword arguments _can_ come before *args, but *args must not come before **kwargs, when used together. So, the change that prevents errors is still legitimate Python, but of course I have no idea why it works. I made all of these changes and moved the *args to the end of all the functions. And, it WORKED! At least on one simple form I tried. There is more work ahead. I'm STUNNED at this outcome! I can't thank you enough!! I tested it a lot, but I'm unable to test the PyPI version. It should work great. This is a fantastic thing you've done! Sorry I wasn't more clear about how the v.2.7 changes are meant to work. Though I haven't tested with v.3.x, the same PySimpleGUI code _should_ work under either rev. That's why the function returns an empty tuple when the version != 2.x, because the super() call doesn't need any params under v.3.x. How can I add a background image that covers the entire window of the app. I don't see the functionality anywhere. Only changing the colour. nothing happens. Tried changing colour variable also. Make sure you make the call to ChangeLookAndFeel PRIOR to your layout definition. The layout needs to know the colors. You can also call SetOptions with the individual color choices that you want. It is not blocked from being called by Macs. The reason for blocking the Look and Feel call is that button colors do not work on a Mac. Feel free to log an issue on the github if it continues. if the user hits enter?